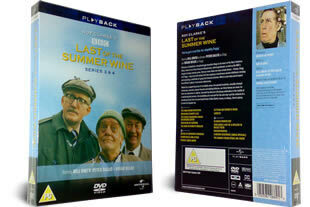 The Last of the Summer Wine DVD set containing 3 DVD's and the series 3 and 4. DELIVERED FREE IN THE UK. Series three and four on 3 dvd's of the BBC smash comedy. Three elderly delinquents have a series of funny misadventures as they enjoy their retirement. The envy of their hen-pecked married friends, they embark on hillarious stunts as if in their second childhood. Old age never seemed so much fun! Features all the episodes from the eleventh and twelth series of the show. 3 DVD Box Set delivered to your door.